Internet Explorer 64-bit will not work. Note that this is not the same as Windows 64-bit. Windows 7 64-bit comes with both Internet Explorer options for use. However only the Internet Explorer 32-bit will allow TruView to work. All other browsers are NOT supported. 1. In the Internet Explorer address bar, at the top of the Internet Explorer window there is an icon displayed as shown below. This icon allows the browser to run in Compatibility Mode for websites that are made for older versions of Internet Explorer. For TruView and the Ollerhead website we must ensure this is turned off. 1. Go to Settings > Internet Options and click on the Security tab. 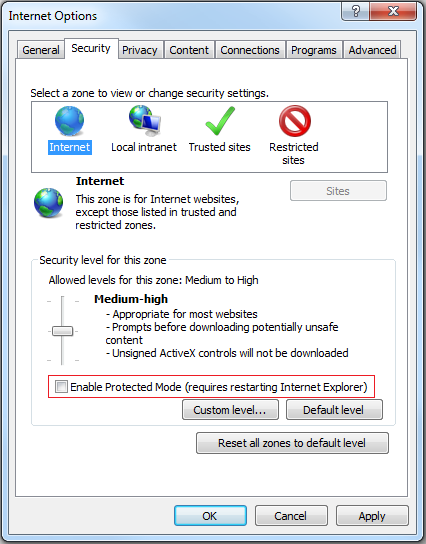 Ensure the box next to “Enable Protection Mode (requires restarting Internet Explorer)” is unchecked. Click OK at the bottom of the window. If any warnings appear click OK.
2. Go to Settings > Internet options and click on the Advanced tab. Scroll down the list to the heading Security. 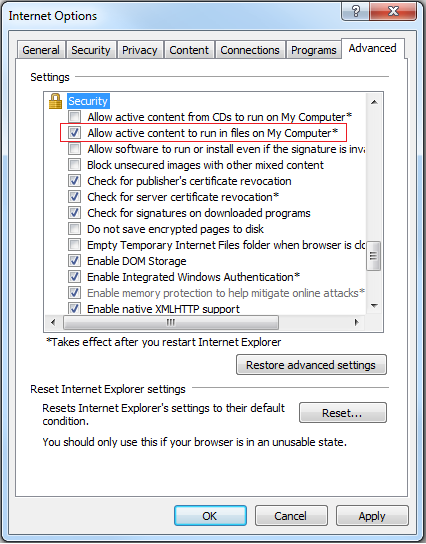 Make sure that the box next to “Allow active content to run in files on My Computer” is checked. If not, click on the box and a check mark should appear, then click Apply in the bottom right corner of the window. 1. 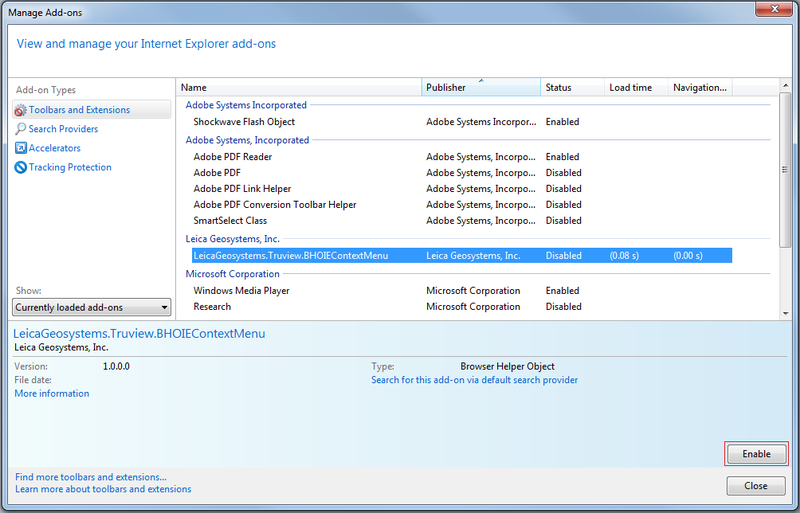 After TruView is downloaded it becomes an Internet Explorer Add-On and may need to be enabled. Go to Settings > Manage Add-Ons. Make sure you are looking in the Toolbars and Extensions section. 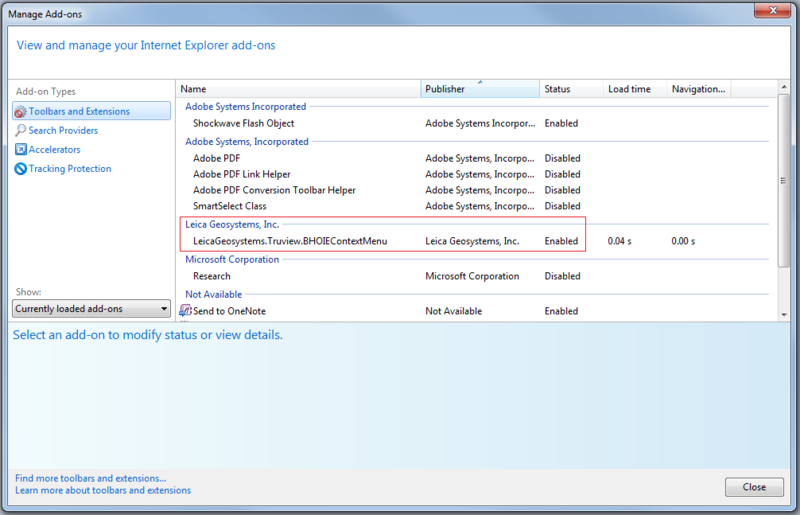 Look at the add-on names “LeicaGeosystems.Truview.BHOIEContextMenu” and make sure the status is “Enabled” as shown below. If the status is not “Enabled”, click on the “LeicaGeosystems.Truview.BHOIEContextMenu” and click the “Enable” button that will appear in the bottom right corner.